We are pleased to be able to refer customers to a local UK motorcycle tour guide for those who are perhaps unfamiliar to these shores or even who want to enjoy the ride rather than stare at a map trying to decide where to go. The guide, Peter Scott (Scottie), is available pretty much anytime with reasonable notice, subject to other booking commitments on a one to one or group basis. Scottie is a former Chief Observer with the Institute of Advanced Motorcyclists and was also the Chief Instructor with the Schools Training and Education Programme (Star Rider). Although qualified and able to offer advice on riding styles he is quite happy to simply ride any variety of routes both in the UK or mainland Europe. 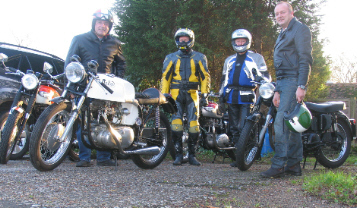 With over 30 years experience on a huge variety of bikes he has also amassed some useful basic mechanical knowledge which is always handy when riding a classic bike. Having owned or ridden most of the bikes we have in our fleet he fully understands the abilities and character of the bikes. Scottie has a wealth of experience guiding riders through Europe, Australia, Asia, the Far East and the USA. He currently works with Surrey Police as an Observer on their Nationally acclaimed BikeSafe programme. With a wealth of local knowledge Peter is also able to seek out those hidden watering holes “special” eateries via some of the best roads in the country. So to maximise your enjoyment of your classic bike, contact Peter to discuss your requirements or even simply to pick his brains over a jar in his local. All rides will be tailored exactly to your requirements and advice on accommodation, security and other elements of your vacation can be provided if required. Prices start from around ?25 per person per day (subject to a minimum hire rate of ?10 p hr.) plus expenses depending on requirements. Please contact Peter direct at g dot day at ukonline dot co dot uk (sorry to spell it out, stops email trawlers!) or +44 (0)7780 994455. Peter is an independent guide, not an employee of Classic Bike Hire, whatever deal you come to is between him and you.